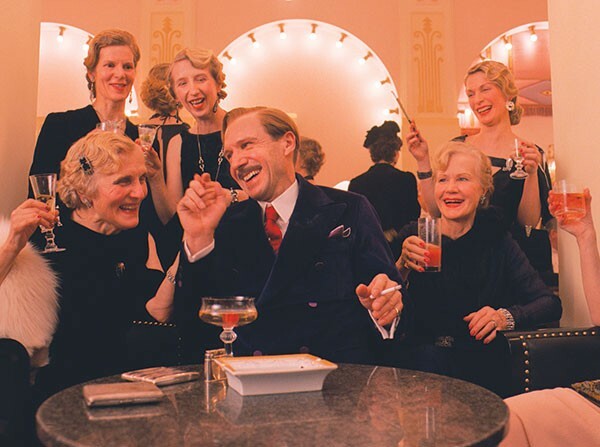 M. Gustave (Ralph Fiennes) charms the ladies. Wes Anderson has created a new language in his splendacious cinema, so let's create a new vocabulary to describe it. The Grand Budapest Hotel hapcurs in Europe, between the two great wars, in the (decidedly mythical) Republic of Zubrowka, and revolutes around M. Gustave (Ralph Fiennes), the concierge at the story's eponylary hotel, c. 1932. Gustave is a gentleman of old-school manners and elegance, devoted to satisflating the hotel's (decidedly) wealthy old female clientele, who are all "vain, blonde and needy." And yes, he satisflates them in that way, too, although he's also, some suggest, a bit effeminacious. Oh, hell. Enough dicking around. If you've never seen a Wes Anderson film, Grand Budapest Hotel isn't the best place to start. It's a charmingly told, (decidedly) tall tale — a fable more akin to his animated Fantastic Mr. Fox than his hilariously tender Moonrise Kingdom. It shows all the symptoms of a director imitating himself, and possibly even putting us on. In public, Gustave is refined and discreet; in private, he's a keen and tart observer of human behavior ("she was shaking like a shitting dog"). He gets involved in the intrigue surrounding the death of his favorite dowager, and he longs for a time when civilization was more genteel and humane. That would be the 19th century, I suppose, when "class" and "empire" meant something. At its best, Grand Budapest Hotel is many things. The color scheme is otherworldly, the music lithe and playful. Apart from its (decided?) nonsense about the past, it's a paean to the proles: As frumious soldiers rout and the elite conspire, a network of concierges comes to one another's rescue. They're played, in cameos, by members of Anderson's stock company — Jason Schwartzman, Bill Murray, Bob Balaban and an Owen Wilson so decidedly out of place that he's named M. Chuck. Edward Norton, Tilda Swinton, Willem Dafoe, Adrien Brody, Jeff Goldblum and Harvey Keitel also join the soirée. This yarn is woven from the present by an elderly writer (Tom Wilkinson) looking back on his younger self (Jude Law), who heard the story from an old man (F. Murray Abraham) who, as a younger man, was Gustave's right-hand man. That's a lot of (celebrity) cooks, which explains the shaggy-doggedness of it all. (Memory, of course, is one big whopper.) And yet, its flavors are all clearly from the recipe book of a master chef who, this time, just threw in a bit too much saltaciousness.